Topsham - a port and ship building and ship repair centre since Roman times. Around and about. Lots to see and do. Topsham 4 miles down the River Exe from Exeter- a port and ship building and ship repair centre since Roman times. 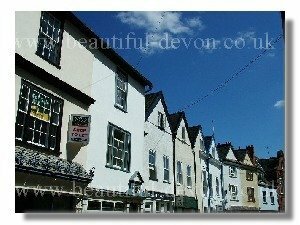 Explore its narrow streets and small shops- antiques and galleries a speciality, not forgetting its pubs and restaurants. If you think many of the buildings in Ferry Road with their half rounded gables remind you of Holland, you are correct, many were built using Flemish bricks brought over as ballast by the port's Dutch trading partners. Walk along the river, stop for a meal in the Passage House Inn or the Lighter Inn or the Steam Packet. Explore the delightful Topsham Museum. Take the foot ferry across the estuary to the Ship Canal and Exminster Marshes. In season at high water take the passenger ferry to Turf, delightful pub alongside the Ship Canal and both reachable by a very pleasant stroll along the opposite towpath on a mild evening. Walk or cycle the Exe Estuary Trail.